Discover the limitless power of God's design in your life in J.P.'s newest book, God Designed: 366 Days of Inspiration. At moments of weakness and strength, God has a design for your life. In times when you need guidance and compassion, God is present in your life and designing you. He wants you to have the best and be the best. Sometimes, we get stuck. 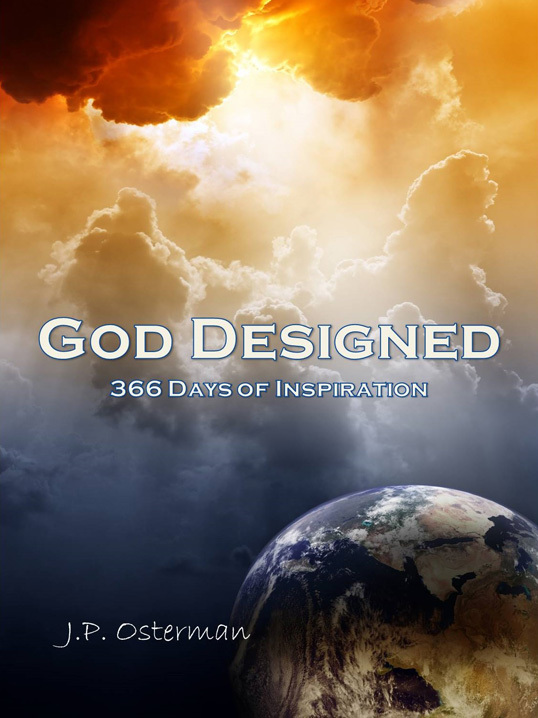 In God Designed: 366 Days of Inspiration, discover daily insights, encouragement, and inspiration to become everything God intends you to be. "Let there be light," God said when He designed the universe. He is our light. And He writes to us personally through His word. Draw closer to Him today with God Designed. J.P. Osterman's debut devotional expresses raw emotions in each of her daily entries. And she writes her entries so her readers can interact with the Bible. J.P. also shares her personal experiences set against the events we face daily. So many problems plaguing this world! Why do bad things happen? Is God listening? Where is He? J.P. addresses these questions in a touching style. She shares her life stories, her days, her ups, her downs, her experiences, and her feelings. She gives Biblical evidence--through God's loving lens--designed to inspire and encourage you. God is in your life, for your life, and for you in God Designed, available at www.CreateSpace.com/5787841 for $14.95 and at http://tinyurl.com/msb8uc7 for Kindle at $2.99. J.P. Osterman was one of five finalists in the Brevard Library Foundation’s, Patrick D. Smith Literary Award. She won a prestigious Rupert Hughes' Award at the Maui Writers’ Conference for her novel, The Matter Stream, which she has been transforming into her Nelta Series. Her one-act play, The Man Next to Me, won First Place at the Southern California Writers’ Conference and was published in the San Diego Writer’s Monthly. She transformed the play into her mainstream fiction novel, Pete’s Crossroad and short story, “The Man Next to Me.” J.P. has a Bachelor’s Degree in English (emphasis in writing) from the University of San Diego, and she graduated with Master’s Degree in Education from Azusa Pacific University. While teaching high school English in the 1990s, she met Ray Bradbury who inspired her to write science fiction. Including God Designed, J.P. has written ten novels, from exploring Mars in Cosmic Rift to contacting ancient aliens in First Communication (Book I, The Nelta Series). Battlefield Matrix (Book II) and Astrocity Sagan (Book III) continue her Nelta series. She recently compiled and released two short-story books, Commuter Collection: Short Stories from the Edge and Pareidolia: Science-Fiction Short Stories. J.P.'s other novels include The Screaming Stone (young-adult fiction with a twist of fantasy) and her whistle-blower suspense novel Corporate Revenge. J.P. is currently Secretary of the Space Coast Writers’ Guild. You can find a synopsis of J.P.'s books at www.jposterman.com and http://tinyurl.com/msb8uc7 . She also blogs at BeGodInspiredToday.blogspot.com . Meet JP Osterman at the Meet the Authors Book Fair in the Eau Gallie Civic Center in Melbourne, Florida, on November 21 and 22, 2015, from 9:30AM to 4:30PM. The book fair is in conjunction with the ArtWorks Eau Gallie Fine Arts Festival. Both are free and open to the public.